Welcome to the hellish month of August! Okay, so maybe it won’t be that bad for a lot of people, but this is the month where Simon will be making his world debut and I lose all track of time, sleep, my mind, etc etc. As such, I have a month long schedule of authors and bloggers stopping by to help keep everyone entertained and a few more contests than normal. I’ll be posting a schedule soon. I will not be doing any of the news posts this month – sorry, but I’m going to use those hours to sleep, get adjusted to two boys in the house and prepare the monkey for his first day of school. However, I’ll be keeping my eyes on my reader (because that would be a horror if I ignored it for a month) and will post everything in September’s newsletter. I am a Facebook junkie, so if I come across anything really good, I’ll throw it up on the LE FB page as I will be doing with any covers that show up. LE launched the Chat Room this month and we’ve already had two great events take place within it’s walls. On July 8th, Chloe Neill celebrated with us by being the first author to do a live chat and for those who attended, a great time was had by all. On July 27th, Jaye Wells stopped by to be the second author to attempt it (transcript coming soon). Another great feature that is using the Chat Room is the LE Book Club. At the end of each month, we’ll be getting together to chat about the current month’s pick. We just held the first discussion a couple nights ago after reading Night’s Cold Kiss by Tracey O’Hara. The Book Club’s August pick is going to be Mind Games by Carolyn Crane with the discussion to begin at 9pm EST on August 30th. LE is giving away a signed copy of Secrets of Blood and Bone by Robert Sadler. Contest ends August 5th. The Baby pool – one $15 gift certificate is up for grabs. Contest ends as soon as Simon shows up (which is soon I hope). I just posted a bunch of new release dates, but here are a few more. Woot! There’s finally a release date for Colleen Gleason’s new novel, The Vampire Voss. If you haven’t heard yet, Colleen has written a new historical vampire romance that is totally unrelated to the Gardella series. The Vampire Voss will be out in April 2011, which means we should be seeing something about it soon. In more Gleason news, for those who are going to be in the Ann Arbor area on September 12th, Colleen will be attending the Kerrytown Bookfair as a panel attendee and doing a booksigning. I’m not sure on times yet, but the website says noon, so expect a full day event. Jennifer Estep has posted the cover for the fourth Elemental Assassin’s novel, Tangled Threads, due out April 26, 2011. A benefit for California Ferret Legalization! Private investigator Harper Blaine is a “Greywalker,” someone who lives in the realm between life and death. In this, her fifth adventure, she’s back on the trail of the man – alive or dead – who killed her for two minutes, making her a Greywalker. Harper’s father is missing, and she’s convinced that her attacker knows the truth behind this as well. Harper’s constant companion is her ferret, Chaos; Richardson, a ferret owner herself, has pledged all her royalties from this signing to the movement to legalize ferrets as pets in California. For more information about this cause, visit http://www.legalizeferrets.org/. The fifth Greywalker novel, Labyrinth, is releasing on Tuesday and this would be the perfect excuse to purchase a brand new hardcover. I know hardcover prices are horrible, but it’s going to benefit ferret legalization – it’s a worthy cause, right? I’m not sure if Mystery Bookstore will be doing sign and ships for anyone who can’t make it out there, but if you’re interested in helping a great cause, give them a call at (800) 821-9017. 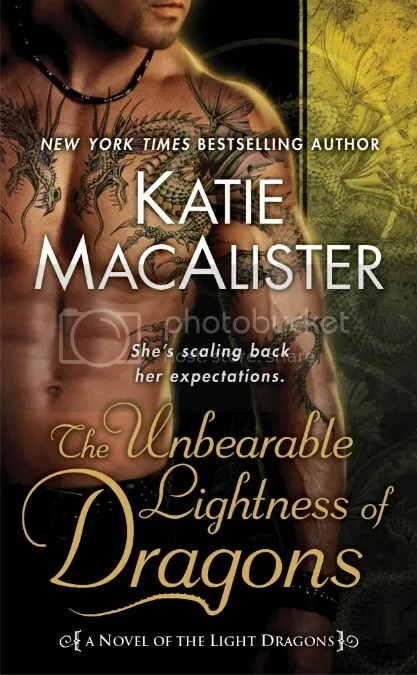 Katie MacAlister has posted the cover for her second Baltic novel, The Unbearable Lightness of Dragons, which is due out at some point in the near future. I’m still trying to locate a release date. Stacia Kane has posted an excerpt for her third Downside Ghosts novel, City of Ghosts, which comes out July 27th. Nalini Singh has posted an excerpt for her latest Psy-Changeling novel, Play of Passion, which comes out this November. Rachel Vincent has posted small snippets from two of her upcoming novels – Alpha (October 1st) and My Soul to Steal (January 1st). Plus an additional excerpt from Alpha, which left me in tears. Could be the hormones though. Jeanne Stein has a short story, The Ghost of Leadville, posted up at Tor.com. Shiloh Walker has fabulous news for fans of her Grimm Circle series. The novella, I Thought It Was You, is going to be available for free download at Samhain Publishing as well as the major retailers (although it is available now at Samhain). There’s also an excerpt up for the third novel, Crazed Hearts, which came out this month. Cynthia Eden has posted a new excerpt from her upcoming novel Deadly Fear. Ilona Andrews has posted an excerpt from their story A Questionable Client, which can be found in the anthology Dark and Stormy Knights. Shiloh Walker has put up a snippet from her September release, Tarnished Knight. There’s also a snippet up from Crazed Hearts, the third Grimm Circle novel. Kelley Armstrong has posted the sixth and seventh chapters from her online serial, The Divided. Lauren Dane has posted an excerpt from her upcoming de la Vega Cats novel, Revelation, released today. Ilona Andrews has posted two fabulous snippet from Magic Slays – Part 1 and Part 2. Diana Gabaldon has posted an excerpt from an upcoming short story titled Terror Daemonium (or possibly The Space Between). This story does take place after An Echo in the Bone, so be wary of spoilers. Lara Adrian has posted an excerpt of her upcoming Breeds novel, Taken by Midnight. As we’ve all heard, the Vampire Academy series by Richelle Mead has been optioned for either film or television and to help boost the chances of us actually seeing it produced, Preger Entertainment has created a Facebook Page to help spread the word. They are not far from hitting the 10k mark, so hopefully a studio will see that this could be a good thing. Ilona Andrews has announced the title for the fifth Kate Daniels novel – Magic Slays. Does this mean we’re getting closer to actually reading the whole thing? Marta Acosta has some fabulous news. Tor Books has bought The Shadow Girl of Birch Grove!! Which means if you haven’t read it for free on Scribd, something tells me you won’t be able to for much longer. That, however, is great news for Marta – Congratulations! Yasmine Galenorn has a great surprise for readers of the Sisters of the Moon series. Starting July 30th, the Moon Daughters web comic will begin appearing on a weekly basis, following the daily lives of Camille, Delilah, Menolly, Maggie and Iris. You’ll only be able to see it on Yasmine’s website, so make sure you have it bookmarked. The Smart Chicks Kick It Tour has it’s own blog now. The schedule now up and I’m sadden to see the closest they’ll get to me is Ohio or Toronto. Jeaniene Frost is going to be doing a small tour to promote Eternal Kiss of Darkness. Unfortunately, she’s not coming anywhere near Michigan or really going anywhere past Georgina. So if you’re in the Southeast, check out her schedule. Am I the only one who didn’t notice JR Ward announcing the title to Payne’s book on her facebook page? Hopfeully not, but if that’s not hte case, the next Black Dagger Brotherhood novel will be called Lover Unleashed and we’ll get it in April 2011. Melissa Marr has announced the sale of the first three stories in a new trilogy. Although, don’t go by the Publisher’s Weekly announcement too much – Melissa has a few corrections for it in her announcement. For more, you can also check out the PRNewswire announcement. Also, Graveminder has a release date of July 2011. Rachel Vincent has posted a territory map for her Shifters series. Ever wondered what the South Central Pride looked like? Now you can see. Jennifer Estep has posted the blurb for the fourth Elemental Assassin novel, Tangled Threads. Since it could be could be spoiler for those of us who haven’t read past Web of Lies yet, I won’t repost it. Karen Mahoney has fabulous news…her novels, The Iron Witch and The Wood Queen, have both sold UK rights to Random House Childrens Books. Anne Bishop has another Black Jewels novel coming out. This time, Twilight’s Dawn, will feature four novellas featuring our favorite characters. Twilight’s Dawn is set to be released March 2011. I know I am not the only Outlander junkie out there, so check this out – it’s being turned into a musical! Diana announced it awhile ago, but now there’s a website with cast and music info. Patricia’s Vampire Notes pointed me towards this book a little over a week ago and I just new I had to make it my featured book this month. The hubby is a fan of Fred Saberhagen, so something tells me I’ll just have to get this one soon or I may be able to talk to hubby into reading it. The immortal Count Dracula–Bram Stoker portrayed him as a terrifying creature of the night, preying upon the pure and innocent. The truth is far different. For Dracula is no villain, but a noble, powerful tower of strength. And it is those who hunt him who are the true villains! The Dracula Tape is actually the first novel in a series that was originally published in 1975 and will be re-released by Tor December 28, 2010. The rest of the series includes (in order): The Holmes-Dracula File, An Old Friend of the Family, Thorn, Dominion, A Matter of Taste, A Question of Time, A Sharpness On The Neck and Vlad Tapes. If you’re interested in the series as a whole, PVN has all the blurbs posted. The Paperback Dolls have started a brand new reading challenge – Moning Maniacs Challenge – and it’s all about reading (or re-reading) the Highlander and Fever series before the release of Shadowfever in January. Check out the fabulous news Vampire Wire had. I can’t believe I missed this. Darque Reviews is back! Kimberly took some time off last fall and it’s fabulous news that she’s back. Dark Faerie Tales is back with her fabulous Publishing News Reports. Want to know what’s in the works, click here and find out. That’s it?! Seriously, some of my sections seem a tad bit small this month. That’s what I get for not holding on the news a few days to beef this up, huh. Plus, I am doing something a little differently with the newsletters that may not be obvious (or may be if October’s is like this); but I’m not heading to any author websites who I also have in my Google Reader. Last month, I found that because I read their blogs on a semi-daily basis, I wasn’t finding anything too new on their websites. So this means I can add a few authors to my list. If there’s a certain author you want me to keep an eye on, let me know and I’ll add them to my list. Tor.com is giving away Black Swan Rising by Lee Carroll and The Longman by Steve Englehart via GoodReads. Contests end August 18th. This month, there were 59 different covers revealed, so needless to say, I’m not posting them all here. Sorry guys, but I did save them all over at the Facebook Fan page. So if you want to see all of them, head over here; however, that doesn’t mean I won’t paste some of them here.